Welcome back! It’s season finale time, and the team has had to contend with some major reveals, like how they’ve been manipulated by the Time Masters to help Vandal Savage secure a place of power on Earth. That manipulation was to stop an alien invasion in the future, but it also went further, into Rip’s superiors ordering the death of his family! To stick it to the Time Dicks, Snart sacrifices himself to destroy their ability to look into the timeline. That still leaves Kendra and Carter prisoner of Savage, on board his own timeship. So how will this season finale go down? Home Sweet Home. 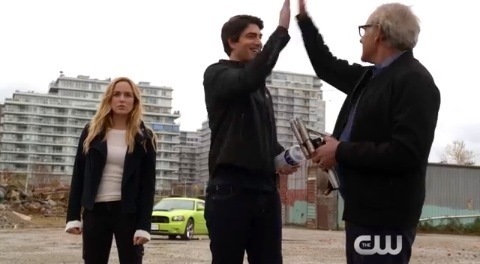 The Waverider lands in Central City, five months after the team took off on their mission. As everyone walks out, Rip announces he’s failed his mission, and as a result, he’s cutting them loose. Oh, and they’ve been talking to a hologram because the real Rip takes the ship away (oh, and he promises to immediately return those infant and teen versions of them back into their place in the timeline for those of you who care about what happened a few episodes back). So our group is left to figure things out, and for some, it’s not the worst transition to return to the world they know. Except for Sara, who has to learn from her dad that her sister Laurel, the Black Canary, was killed (that’s all covered in my Arrow recaps of this season, which, you can read on your own time). Meanwhile Rory is trying out a new partner in crime to sad results when an unexpected getaway driver shows up: Ray! Ray has a proposition for Rory, in they need to get everyone back together to bring Rip to them and go find their imprisoned teammates. Everyone is actually cool with that, as they meet up, letting Ray and Stein set up a temporal beacon to reach out to Rip, who answers it. He really doesn’t want them back, but considering his lack of luck finding Kendra and Carter, isn’t left with much choice. Message In A Helmet. Kendra is seen running through some woods, where she bumps into…a World War II era U.S. soldier! She is in 1944 France, and she gets an idea, writing a note she shoves into the unsuspecting G.I.’s helmet. That G.I. also doesn’t see coming the throwing knife that kills him, courtesy of Vandal Savage. Kendra is dragged back to his timeship, where she’s being forced to donate some blood along with Carter, for a little project that makes up why he’s there. He says the meteors that granted them their immortality were Thanagarian (a familiar name from last episode), and that he is going to use their blood, along with the meteors for a grand purpose. Saint-Lo, France, 1944. So yeah, the Waverider heads there, and realize Savage is looking for one of those Thanagarian meteors. He happens to have found it, being carted by a Nazi convoy, and attacks it with his blades and some of his future soldiers. As the team shows up to fight, Firestorm locates Savage’s timeship and breaks Carter out, with Kendra nowhere to be found. During the escape and the team falling back to the Waverider, Firestorm grabs a soldier’s weapon, and instead of burning it, he turns it into sand. Important to note that for later. But now Savage has his meteorite, but for what purpose? SUPER JUMP! IT’S THE SUPER JUMP! Stones of Destiny. On the Waverider, Carter tells the team what he overheard Savage talk about, and the pieces come together about what Savage’s plan is. The reaction to that Thanagarian blood to the meteorite would cause a reaction that would create a powerful time pulse if dropped in the proper planetary alignment. Done with all three meteorites in three different time periods, it would create a pulse that would eradicate history back to when the meteorites landed in Egypt. Yep, creepy villain wants to rewrite history so he’ll always have Kendra, and we can’t have that. There is a plus to all of this: while the meteorite charges to critical mass, Savage will be mortal. Which means the team can kill him…in three different times, being 1958 (back when he was experimenting with Hawk monsters), 1975 (when he was making that nuclear bomb deal), and 2021. “Why kill him in one, when we can kill him in all three?”, they ask. Yeah, why not. Three Teams, Three Times. The team splits up, with Ray and Rory going to 1958, Firestorm and Sara going to 1975, and the rest going to 2021 Central City. While they let Savage do his ritual thing (with Kendra in tow), the second that those meteorites start glowing, the team attacks. Kendra is busted loose, and joins the fight with Carter and Rip, and then the real fun begins. Rory torches the Savage of 1958, Sara snaps the neck of that Savage in 1975, and the Savage of 2021 gets stabbed by Kendra and electrocuted to death by Rip. After watching three Vandal Savages die much deserved deaths, there’s still the meteorites to contend with. Firestorm uses that cool transmutation power he discovered in France to turn one rock into water, Ray uses a shrink ray to turn another into a useless pebble, and the team manages to reunite in 2021 to deal with the last one. But both Ray and Firestorm can’t destroy this one, and if it goes, it could lay waste to the city. Timebomb. So Rip decides to pull the heroic sacrifice play, and use the Waverider to fly the meteor into the sun. He’s just bringing the ship in as he has a vision of seeing his family again, which snaps him out of his little suicide play. So, he flings the rock out into the sun to explode, and travels back to just when he left. The ship’s not in the best of shape, but it can still get the team home. Rip offers something else before they go: with the Time Masters out of power, he needs a team to safeguard time, and wants them, but only if they want to go. 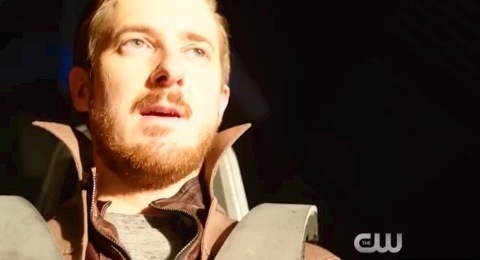 Rip Hunter: he really doesn’t plan things very well, does he? Legends. We get to see Rory taken a few years back to see Snart again and give him a sense of closure with his friend. Sara visits Laurel’s grave and Quentin encourages her to follow the path she wants to follow. Jax and Stein’s wife convince the good doctor to go on another “sabbatical”. So that’s everyone, except Kendra and Carter, who want to stay behind and live their own lives for a while. So with the rest of the team meeting Rip and the Waverider, it seems we have a team again…and then another timeship shows up, crashing near them! A man emerges, warning them all not to go or they will all die. When asked how he knows that, it’s because they told him in the future. Then he introduces himself as Rex Tyler, of the Justice Society of America! Say what?! And that’s a wrap on season one! –Comic book connections: So the Thanagarians are alien hawkpeople, which is a concept introduced back in the DCU in the 1980’s, which also inadvertently screwed up the origins of Hawkman to such a degree, that the Zero Hour event series years later rebooted the whole origin completely. Now, Rex Tyler is also known as the hero, Hourman, who was a founder of the JSA. Among its founders were The Flash (Jay Garrick), and a few other familiar names to people watching this and it’s sister shows. 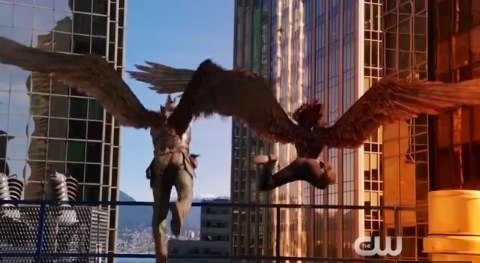 –Nice nod back to the “Night of the Hawk” episode with that brief attack by that mutated hawk person. –Did Firestorm accidentally burn that vase Ray and Kendra had? Because, yay! –Rory still has both his flame gun and Snart’s ice gun, so good on him. A new code name in season two, perhaps?